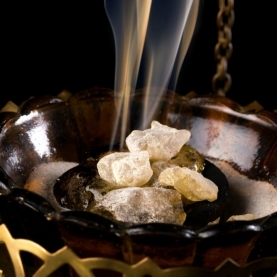 In ancient times, resins were used in most sacred ceremonies and rituals to energetically uplift and cleanse the environment. Resins are derived from the gummy sap that oozes out of the Boswellia trees when the bark is cut. The leaking resin is allowed to harden and scraped off the trunk in tear-shaped droplets. They are quite fragrant when burned giving off a sweet, somewhat citrusy scent. This kit contains all that is needed to re-create a sacred space in your home any time of the year!